The Tourist Information Centre in Great Malvern is towards the top of Church Street in the centre of the town, on the right as you walk up the hill. The staff here are extremely knowledgeable about the area and always keen to help, in addition to having numerous leaflets, brochures and books that could be useful to you as a visitor. Throughout Great Malvern you will see small plaques with a square of black and white smaller squares on them. These are QR Codes. 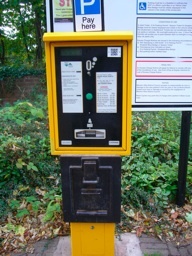 For example, on the car park ticket machine pictured on the right, the QR Code Plaque is affixed in the top right corner. To read the QR Code plaques, you need to have a smart phone (for example an iphone, Blackberry or Android phone). Download a free app from your app store to enable you to read these codes. One of the best free apps is "i-nigma". Once you have this app on your phone, allow the camera to view the QR code and then approve the website request. Your phone will then open the website with the associated tourist information, walking directions to the Hills and special offers available at near-by businesses. This information is tailored to the location in which you are in when you scan the QR Code. The following locations have QR Code plaques. Many more are expected to be added in the future.